This tutorial describes how to use the different types of LiveCode fields to enter and display text. Fields allow you to display text in your application. You can also use fields to allow the user to enter and edit text or make selections. Fields support multiple fonts, styles and colors and can display a basic subset of HTML and RTF text. There are 5 basic field types in LiveCode, all of which you can add to your stack from the Tools Palette. All these objects are really the same type, they are just templates with different properties set to give different appearance and behavior. For example you could add a basic text entry field to your stack and by setting the appropriate properties turn it into a scrolling list field. The first 3 field types are very similar, label fields cannot be edited by the user but the others can. The only difference between a text entry field and a scrolling field is that a scrolling field is larger and has its vertical scrollbar turned on. You can put text into a field by typing into it directly, using the 'Contents' pane of the field Property Inspector or by setting the text property of the field in script. put word 1 of field "text"
For more details on using chunk expressions see this lesson. Table fields allow you to display data in cells, and optionally allow the user to edit the cells. 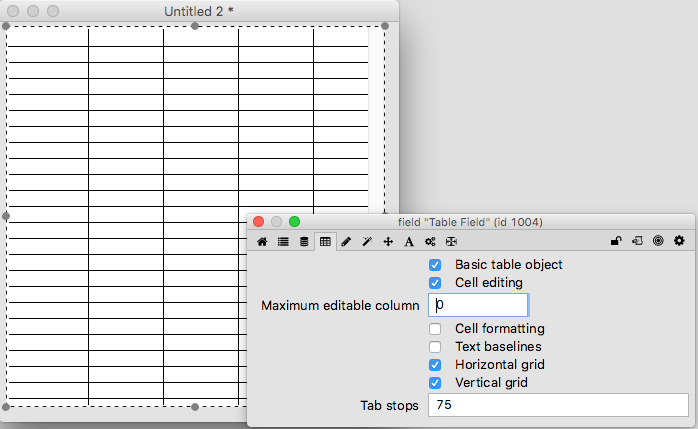 Table fields are ideal for displaying basic tabular data. For more complex data display requirements we recommend you use the Data Grid control. You move between cells in a table field by clicking in a cell or using the tab and return keys. Setting the text property of a table field to tab delimited data inserts the data into the relevant cells. A field is made into a table field by turning on the Basic Table object option in the Property Inspector. 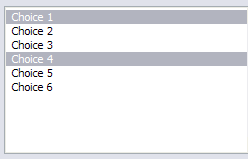 List fields allow you to display a set of choices. Users cannot edit list fields. You can allow the user to select multiple lines by setting the multipleHilites property to true and allow them to select lines that do not appear together by setting the noncontiguousHilites to true. Both these properties are available in the Basic Properties pane of the Property Inspector of the field. To select a contiguous range of lines use shift-click, to select multiple non-contiguous lines use cmd-click or ctrl-click. To check which line or lines are selected use the hilitedLines property, this returns the line number of the selected line, in this example the value of the hilitedLines property would be 1,4. You can also set the hilitedLines property to highlight lines in the list field. You can set the text color, size and font of fields. You can also set the background color and highlight color of a field. These properties allow you to give fields a highly customized appearance within your application. In my app I'm developing for android I have a scrolling text field which displays text imported from a text file and a scroll bar that the user can use to change the size of the font in the display field. set the textSize of field "display" to the tuhmbPosition of fld "scrlBar"
This is inside a handler and it's working fine. The issue is that when I set the font size to larger then 16 the characters within the field get one on top of each other and it's not readable. And it's not due to lack of space in the display field. On development mode it works properly, the issue starts only when running on my mobile. I did a quick test and it seems ok here, could you let us know what OS you are on, what version of LiveCode you are using and what version of Android and device you are testing on so we can look into this. It might be easier to email support@livecode.com, if you do it would be useful if you can attach your stack so we can have a look at it. I contacted support and the issue was that I was using an outdated LiveCode version which had a bug with android fonts. I updated to livecode 7.0.6 and the problem was gone. That's great, glad we could help. You can also set the hilitedLines property to highlighted lines in the list field. Hi Rene, thanks for bringing that to our attention. I have updated the text in the lesson. Problem with the properties multipleHilites and noncontiguousHilites. I have set them to true (by script or with the property inspecor), but it doesn't work. A single line is always selected in the locked field. My LiveCode version in 10.0 Community Edition. Can you explain that ? Thanks ! With these properties set to true you can select a contiguous range of lines using shift-click, or select multiple non-contiguous lines using cmd-click or ctrl-click. I have added this information to the section of the lesson on list fields. Thanks for your answer. OK ! It works. However, I think it's a pity that the user must use a combination of kees. In my point of view, when the property "select-continuous lines" is selected in a locked field, it would be logical that the selection works without cmd ou ctrl click. I am thinking that this opportunity could be interesting for apps created for young children. The current operation prohibits its use with small kids. Hi Paul-Luc, my apologies, there is another property that I didn't mention yesterday. If you set the toggleHilites property of the field to true, along with multipleHilites and noncontiguousHilites, it will behave as you describe. may i know how to add data that have been chosen from scrolling list field into database Mysql. It seems to me that "set the hilitedLines..." of a List field doesn't work when it is inside an openCard or preopenCard script. Am I correct? If answer is yes how should I do in order to set the default of a List field when the App starts? I did a quick test here and setting the hilitedLines property of a field in a preOpenStack handler works for me. Could something else in your code be resetting it? Do you have an openField, focusIn or selectionChanged handler anywhere? Hi Elanor, as a matter of fact there was an error in my code...everything works OK. Sorry for the confusion when I found out it was too late. Cheers! No problem, glad to hear you got it sorted out! Hi there. Is there any way to check the input of the user in a field if it is a correct email? I have searched much time but I could´n find some tipps or tricks. I have tried to check with "if then"-condition (to identify the @-Symbol and answer a warning, if no @ is in the string) but I have no idea how I can check, that someone put in the correct part of the string right from the @ (e.g. the .com or .de or .org). Could you help a little bit? Thank you very much.